The German Chancellor, Angela Merkel, says she will buy a list of alleged tax avoiders said to be hiding money in Switzerland - if it is a genuine one. Up to 1,500 Germans are alleged to have stashed millions of dollars in secret bank accounts across the border. The Financial Times Deutschland reported that the data was being offered by an IT specialist who once worked at HSBC in Geneva. He is said to be asking $3.5m (£2.1m) for the list of names. Some estimate it could net the German government $100m. However, the Swiss finance ministry said it had refused to grant Germany any assistance in connection with the document, saying it was based on stolen information. 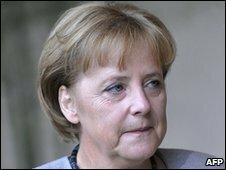 "Everything should be done to get this data," Mrs Merkel told a news conference in Berlin, as long as the information was "relevant". Two years ago, Germany paid $7m for a similar list of German citizens who had money in Liechtenstein, a country that was known as a tax haven. That information uncovered some high-profile names of tax-avoiders, including Klaus Zumwinkel, the former head of Deutsche Post. He was given a suspended jail term for hiding £1m. German politicians are divided over whether to buy this new list, says the BBC's Oana Lungescu in Berlin. Some leading members of Mrs Merkel's centre-right coalition argue it is wrong to deal in stolen goods. Others say it would be scandalous not to crack down on tax evaders.